Objectives: Veno-occlusive disease after liver trans-plant has been sporadically reported, and significant uncertainty exists concerning the best treatment and the long-term outcomes. Here, we reviewed our experience to evaluate clinical presentation, treat-ment, and the long-term outcomes of these patients. Materials and Methods: Between 2000 and 2015, 2165 patients underwent liver transplant at our center. The incidence of veno-occlusive disease was 0.3% (7/2165). Results: Timing of veno-occlusive disease onset (median 4.7 mo; interquartile range, 2.5-11.1 mo) varied widely as did clinical presentation, which was characterized by a variable association of liver failure and portal hypertension and different disease pro-gression rates. In all cases, diagnosis of veno-occlusive disease was confirmed by liver biopsy. Six patients (85.7%) presented with veno-occlusive disease after a previous episode of acute cellular rejection. Three patients died due to veno-occlusive disease (n = 2) or due to hepatocellular carcinoma recurrence (n = 1). Two patients were treated by increasing immunosup-pression and with interventional pro-cedures (pleurodesis and transjugular intrahepatic portosystemic shunt, respectively), and 2 had successful retransplants. 5-year patient and graft survival rates were 57.1% and 28.6%, respectively. Conclusions: A tailored approach based on clinical features and including retransplant can achieve acceptable long-term survival in patients with veno-occlusive disease after liver transplant. In the liver transplant setting, VOD has been more rarely reported, with an estimated incidence of 1.9% to 2.3% according to the 2 largest published series from the same French institution.15,16 Literature on VOD after liver transplant is scant, and clinical features, management, and outcomes of VOD seem to differ substantially from VOD after HSCT. There is no accepted management strategy for patients who present with VOD after liver transplant. Furthermore, long-term outcomes of these patients have so far not been evaluated. With the aim of providing further insight into this rare and life-threatening com-plication after liver transplant, we collected and reported our experiences, with a focus on clinical presentation, management strategy, and long-term outcomes. The Institutional Pathology Department database was searched to identify cases of VOD occurring in patients who underwent liver transplant between 2000 and 2015. Due to the retrospective nature of the study, Ethical Committee approval was not required. All VOD cases were identified with a unique code prospectively assigned to each specimen at the moment of examination and reporting. For every patient, we also evaluated liver biopsies obtained previously and subsequently to the index biopsy. All specimens were reviewed by an experienced liver pathologist (ED). Diagnosis of VOD was always based on histologic examination of a liver biopsy obtained because of clinical symptoms (jaundice, ascites, and/or weight gain) or because of alterations in liver function tests. 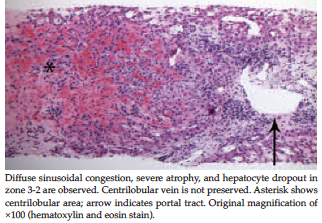 Histologic diagnosis of VOD was based on the presence of significant and diffuse sinusoidal congestion associated with perivenular hepatocyte dropout prevalent in zone 3 of the hepatic acinus and/or centrilobular vein thrombosis or obliteration (Figure 1).17 Patient notes were retrospectively reviewed to gather all available data about pretransplant features, indication for transplant, and posttransplant course, with a focus on VOD presentation, management, and outcomes. Data are presented as number and percentage or median and interquartile range (IQR). To evaluate the effects of VOD on graft and patient survival, Kaplan-Meier analysis was employed. R version 3.3.3 (https://www.R-project.org/) was used for statistical analyses. Among 2165 patients who underwent liver transplant between 2000 and 2015, 7 patients (0.3%) presented with VOD during our defined follow-up, which ended on June 30, 2017. All were recipients of ABO-compatible allografts from deceased brain-dead donors. Indication for liver transplant, baseline immuno-suppression, and early postoperative course (including timing and treatment of acute cellular rejection episodes) are summarized in Table 1. Median donor age was 64 years (IQR, 60.5-72 y), median Model for End-Stage Liver Disease (MELD) score was 15 (IQR, 13.5-17), and median donor age × MELD was 960 (IQR, 940.5-1116). Maintenance immunosuppression was cyclosporine in 4 patients in association with either azathioprine (n = 2) or mycophenolate mofetil (n = 2); the other 3 patients received tacrolimus and mycophenolate mofetil. One patient had an uneventful postoperative course; however, 4 patients (57.1%) presented with early allograft dysfunction (defined as alanine or aspartate aminotransferase > 2000 IU/mL within the first 7 postoperative days and/or total bilirubin ≥ 10 mg/dL and/or international normalized ratio ≥ 1.6 on postoperative day 7).18 Two patients (28.6%) had persistent ascites early after liver transplant. Five patients (71.4%) had episodes of histologically proven acute cellular rejection between postoperative days 5 and 37. Rejection was treated with steroid pulses in all but 1 patient; rejection was associated in 2 patients with a change of calcineurin inhibitor from cyclosporine to tacrolimus. The remaining patient was switched from cyclosporine to tacrolimus and had increased mycophenolate mofetil dosing from 1000 mg/day to 2000 mg/day. In addition, patient 5 received steroid boluses due to a strong clinical suspicion of rejection, without undergoing liver biopsy. As summarized in Table 2, timing of VOD onset from liver transplant was highly variable (median of 4.7 mo; IQR, 2.5-11.1 mo). In all but 1 patient, VOD presented late after a previous episode of acute cellular rejection (median of 5.6 mo; IQR, 4.4-16.2 mo), whereas, in 1 patient (patient 6), VOD occurred less than 1 month after acute rejection. Clinical presentation also varied widely. Three patients had hyperbilirubinemia associated with weight gain, ascites, and/or hydrothorax (patients 1, 2, and 3), three patients had normal liver function tests despite showing persistent ascites/hydrothorax (patients 5, 6, and 7), and 1 patient presented with jaundice, without ascites (patient 4). Hepatic venous pressure gradient (HVPG) was measured in all but 1 patient, with levels varying between 10 and 27 mm Hg (median of 17.5 mm Hg; IQR, 15-18 mm Hg). The lowest HVPG (10 mm Hg) was observed in the patient who presented with late VOD (95 mo posttransplant). Treatment was dictated on a case-by-case basis by symptoms and severity of liver failure at VOD onset and by disease progression rate. Patient 2 presented with upper gastrointestinal bleeding from ruptured esophageal varices; she quickly progressed toward multiorgan failure and could only be treated with supportive therapy. Two patients (patients 1 and 3) developed slowly progressive hepatic and renal failure; patient 3, with HVPG of 17 mm Hg, underwent transjugular intrahepatic portosystemic shunt (TIPS), which reduced HVPG to 11 mm Hg. This was successful in treating refractory ascites but could not halt liver failure progression. Both patients were then scheduled for retransplant, which was not performed due to concomitant diagnosis of hepatocellular carcinoma (HCC) recurrence and pulmonary lymphoid granulomatosis, respectively. Both patients subsequently died. Patients 4 and 7 had rapid deterioration of liver function and underwent retransplant with MELD scores of 36 and 19, respectively. Explant pathology confirmed diagnosis of VOD in both cases; at last follow-up visit, both were alive, with good liver function and without any sign of VOD recurrence. One-week defibrotide course was administered to patient 4 before retransplant with no benefit. Patients 5 (Figure 2) and 6 presented with intractable hydrothorax and ascites, respectively. Both required increased immuno-suppression due to previous clinically suspected or biopsy-proven acute rejection. After immunosuppression was increased, liver function tests slowly normalized in both patients. However, hydrothorax and ascites required further interventions (thoracoscopic pleurodesis and TIPS positioning, respectively). After TIPS posi-tioning, HVPG dropped from 27 to 10 mm Hg. At last follow-up, both were alive with normal hepatic function. Overall, 3 patients died (cause of death was VOD in 2 patients and HCC in 1 patient), 2 patients underwent retransplant, and 2 patients survived with their first liver allograft. No cases of VOD recurrence were observed during follow-up of surviving patients. One-year patient and graft survival rates from VOD onset were 57.1% and 28.6%, respectively (Figure 3); 5-year survival results were identical to 1-year survival rates. We reported 7 new VOD cases presenting after liver transplant. Our series was characterized by a wide variability in clinical presentation, timing, and management, which was tailored to clinical present-ation (ie, predominance of portal hypertension versus liver failure), timing, rate of disease progression, and history of previous acute cellular rejection. Patient mortality and graft loss rates were 42.9% and 71.4%, respectively. Our main finding was that VOD treatment (including timely retransplant in cases of rapidly progressing hepatic failure) could result in long-term survival, as all patient deaths and graft losses were observed during the first year after VOD onset and there were no VOD-related events beyond 1-year follow-up. Concerning etiology of VOD, several reports have shown an association between VOD and previous episodes of acute cellular rejection.15,16,20,24,25 In our series, 5 patients (71.4%) had biopsy-proven acute cellular rejection before they developed VOD. However, in 4 patients, rejection had been treated and was considered resolved well before VOD presented. Due to this delay, it is difficult to establish a direct relationship. Etiology of VOD after liver transplant remains speculative. Whereas in the past it has been related to azathioprine administration, in more recent times, VOD is still observed in patients who are naïve to azathioprine. One hypothesis is that endothelial injury, which represents the initial step in VOD physiopathology, would be an immune-mediated phenomenon. This would be in line with several reports of VOD presenting after episodes of rejection.16,20,25,27 Sebagh and associates observed that acute cellular rejection preceding VOD was char-acterized in many cases by a marked endothelial predilection, a finding further corroborated in a second case series from the same institution, in which patients in whom immunosuppression could be strengthened had more favorable outcomes.15,16 Another intriguing explanation could be that VOD is a late issue of ischemia-reperfusion injury, as the endothelium is a primary target in ischemia-reperfusion injury and the cascade of events that follows endothelial injury strongly recalls what is observed in VOD.28-30 In our series, 4 patients (57.1%) had moderate or severe reperfusion injury at post-reperfusion biopsy, suggest-ing that severe ischemia-reperfusion injury could possibly predispose to VOD after liver transplant. Despite being more rarely observed, the clinical course of VOD after liver transplant appears to be more severe than after HSCT, as reported mortality has been as high as 69%.16 In our series, patient and graft mortality rates were 42.9% and 71.4%, respectively. The reason why VOD evolution after liver transplant appears to be more severe than in other contexts is not clear. One potential explanation is that, because ascites and weight gain are rather frequent events after liver transplant, indolent VOD could be overlooked in many cases. For the same reason, diagnosis and treatment could be delayed in more acute forms, as liver biopsy is generally not obtained before 48 hours from symptom onset and liver function test alterations. This could be potentially detrimental, as early treatment with defibrotide has been shown to be crucial in determining outcomes after HSCT.31,32 Finally, a transplanted liver could be more susceptible to development of severe endothelial injury than a native one. Treatment options for VOD include diuretics, anticoagulants (eg, unfractionated heparin, low-molecular-weight heparin, antithrombin III), ursodeoxycholic acid, defibrotide (which has profibrinolytic and antithrombotic properties but no significant systemic anticoagulation effects), TIPS, and retransplant.1 Sebagh and associates advocated that strengthening immunosuppression could have a role in selected patients.15 In our series, treatment was tailored to the severity and characteristics of the disease and, given the large time span, also on treatment availability (eg, defibrotide). 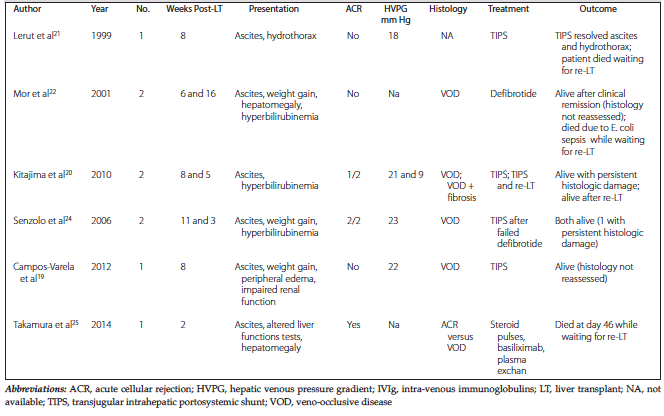 Table 3 summarizes the most commonly adopted treatments for VOD after liver transplant.19-22,24,25,27 Two patients in our series were treated with TIPS, which was successful in 1 patient in whom liver function tests had normalized after immunosuppression was modified. In the other patients with progressive severe hepatic failure, TIPS could partially relieve portal hypertension but had no effect on liver failure. The role of TIPS in treatment of VOD has been put into question due to its high failure rate and its inability to modify outcomes.33 However, this observation was based mainly on patients with VOD after HSCT and in whom organ failure had probably already developed.27 In the setting of liver transplant, some studies have shown that successful treatment can be achieved with TIPS in patients with mild disturbance of liver function tests.15,19,24 Noteworthy, in one case, clinical stabilization was achieved despite persistent histologic damage.24 Thus, TIPS may have a role in patients who present with portal hypertension but preserved liver function. One patient in our series was treated with a short course of defibrotide without success. In VOD after HSCT, defibrotide has been shown to be an effective treatment and was associated with reduced mortality and higher resolution rates.31,32 However, to the best of our knowledge, there is only 1 published report of successful treatment of VOD presenting after liver transplant using defibrotide.22 This could possibly be related to the fact that VOD diagnosis after liver transplant is more difficult than in other settings, leading to delayed intervention and reduced efficacy. It should be stressed, however, that this is based only on sporadic reports and that more experience is required to assess defibrotide efficacy in the liver transplant setting. Two patients in our series underwent successful retransplant and were alive and recurrence free at the end of follow-up. In the early series from Sebagh and associates,16 8 of 11 patients (72.7%) who underwent retransplant died due to sepsis (n = 6) or brain hemorrhage (n = 2). This unfavorable outcome was likely due to a poor clinical status at time of retransplant; indeed, in their more recent article, the same group reported no deaths in patients who underwent retransplant.15 It appears that timely retransplant for VOD is a safe option, provided that multiorgan failure has not yet developed. 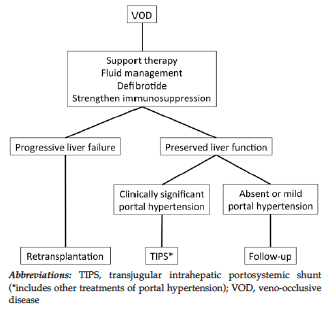 From our experience and the available literature, we propose a management algorithm for VOD after liver transplant as depicted in Figure 4. Limitations of our study include its retrospective single-center design and the limited number of patients included. Our conclusions are therefore based on our experience and on the existing literature on the subject. However, we report in detail one of the most numerous published series of VOD after liver transplant, and it is likely that, given the rarity of VOD presenting after liver transplant, a multicenter study would be required to get more robust indications concerning treatments and outcomes of these patients. In conclusion, VOD is a rare but severe com-plication after liver transplant, characterized by variable timing and presentation patterns and with a still uncertain etiology. After liver transplant, VOD diagnosis cannot be based merely on clinical criteria and must rely on liver biopsy examinations. Due to the variability in clinical presentation, treatment should be discussed on a case-by-case basis. Whenever possible, there is some evidence that increasing immunosuppression could be beneficial in selected cases. Both TIPS and defibrotide could have a role as a definitive treatment or as a bridge to retransplant, which appears to be a viable long-term option if multiorgan failure has not yet occurred. Carreras E. How I manage sinusoidal obstruction syndrome after haematopoietic cell transplantation. Br J Haematol. 2015;168(4):481-491. DeLeve LD, Shulman HM, McDonald GB. Toxic injury to hepatic sinusoids: sinusoidal obstruction syndrome (veno-occlusive disease). Semin Liver Dis. 2002;22(1):27-42. Senzolo M, Riggio O, Primignani M, Italian Association for the Study of the Liver ad hoc Committee. Vascular disorders of the liver: recommendations from the Italian Association for the Study of the Liver (AISF) ad hoc committee. Dig Liver Dis. 2011;43(7):503-514. Soubrane O, Brouquet A, Zalinski S, et al. Predicting high grade lesions of sinusoidal obstruction syndrome related to oxaliplatin-based chemotherapy for colorectal liver metastases: correlation with post-hepatectomy outcome. Ann Surg. 2010;251(3):454-460. Vallet-Pichard A, Rerolle JP, Fontaine H, et al. Veno-occlusive disease of the liver in renal transplant patients. Nephrol Dial Transplant. 2003;18(8):1663-1666. Holtmann M, Schreiner O, Kohler H, et al. Veno-occlusive disease (VOD) in Crohn's disease (CD) treated with azathioprine. Dig Dis Sci. 2003;48(8):1503-1505. Russmann S, Zimmermann A, Krahenbuhl S, Kern B, Reichen J. Veno-occlusive disease, nodular regenerative hyperplasia and hepatocellular carcinoma after azathioprine treatment in a patient with ulcerative colitis. Eur J Gastroenterol Hepatol. 2001;13(3):287-290. Praprotnik S, Hocevar A, Ferlan-Marolt V, Tomsic M. Azathioprine induced hepatic veno-occlusive disease in systemic lupus erythematosus. Lupus. 2005;14(6):493-494. Dalle JH, Giralt SA. Hepatic veno-occlusive disease after hematopoietic stem cell transplantation: risk factors and stratification, prophylaxis, and treatment. Biol Blood Marrow Transplant. 2016;22(3):400-409. McDonald GB, Hinds MS, Fisher LD, et al. Veno-occlusive disease of the liver and multiorgan failure after bone marrow transplantation: a cohort study of 355 patients. Ann Intern Med. 1993;118(4):255-267. Jones RJ, Lee KS, Beschorner WE, et al. Venoocclusive disease of the liver following bone marrow transplantation. Transplantation. 1987;44(6):778-783. Corbacioglu S, Cesaro S, Faraci M, et al. Defibrotide for prophylaxis of hepatic veno-occlusive disease in paediatric haemopoietic stem-cell transplantation: an open-label, phase 3, randomised controlled trial. Lancet. 2012;379(9823):1301-1309. McDonald GB, Sharma P, Matthews DE, Shulman HM, Thomas ED. Venocclusive disease of the liver after bone marrow transplantation: diagnosis, incidence, and predisposing factors. Hepatology. 1984;4(1):116-122. Mohty M, Malard F, Abecassis M, et al. Revised diagnosis and severity criteria for sinusoidal obstruction syndrome/veno-occlusive disease in adult patients: a new classification from the European Society for Blood and Marrow Transplantation. Bone Marrow Transplant. 2016;51(7):906-912. Sebagh M, Azoulay D, Roche B, et al. Significance of isolated hepatic veno-occlusive disease/sinusoidal obstruction syndrome after liver transplantation. Liver Transpl. 2011;17(7):798-808. Sebagh M, Debette M, Samuel D, et al. "Silent" presentation of veno-occlusive disease after liver transplantation as part of the process of cellular rejection with endothelial predilection. Hepatology. 1999;30(5):1144-1150. Dhillon AP, Burroughs AK, Hudson M, et al. Hepatic venular stenosis after orthotopic liver transplantation. Hepatology. 1994;19(1):106-111. Olthoff KM, Kulik L, Samstein B, et al. Validation of a current definition of early allograft dysfunction in liver transplant recipients and analysis of risk factors. Liver Transpl. 2010;16(8):943-949. Campos-Varela I, Castells L, Dopazo C, et al. 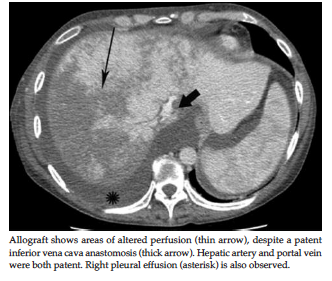 Transjugular intrahepatic portosystemic shunt for the treatment of sinusoidal obstruction syndrome in a liver transplant recipient and review of the literature. Liver Transpl. 2012;18(2):201-205. Kitajima K, Vaillant JC, Charlotte F, Eyraud D, Hannoun L. Intractable ascites without mechanical vascular obstruction after orthotopic liver transplantation: etiology and clinical outcome of sinusoidal obstruction syndrome. Clin Transplant. 2010;24(1):139-148. Lerut JP, Goffette P, Molle G, et al. Transjugular intrahepatic portosystemic shunt after adult liver transplantation: experience in eight patients. Transplantation. 1999;68(3):379-384. Mor E, Pappo O, Bar-Nathan N, et al. Defibrotide for the treatment of veno-occlusive disease after liver transplantation. Transplantation. 2001;72(7):1237-1240. Nakazawa Y, Chisuwa H, Mita A, et al. Life-threatening veno-occlusive disease after living-related liver transplantation. Transplantation. 2003;75(5):727-730. Senzolo M, Patch D, Cholongitas E, et al. Severe venoocclusive disease after liver transplantation treated with transjugular intrahepatic portosystemic shunt. Transplantation. 2006;82(1):132-135. Takamura H, Nakanuma S, Hayashi H, et al. Severe veno-occlusive disease/sinusoidal obstruction syndrome after deceased-donor and living-donor liver transplantation. Transplant Proc. 2014;46(10):3523-3535. Mohty M, Malard F, Abecassis M, et al. Sinusoidal obstruction syndrome/veno-occlusive disease: current situation and perspectives-a position statement from the European Society for Blood and Marrow Transplantation (EBMT). Bone Marrow Transplant. 2015;50(6):781-789. Senzolo M, Cholongitas E, Patch D, Burroughs AK. TIPS for veno-occlusive disease: is the contraindication real? Hepatology. 2005;42(1):240-241; author reply 241. Demetris AJ, Bellamy C, Hubscher SG, et al. 2016 comprehensive update of the Banff Working Group on Liver Allograft Pathology: introduction of antibody-mediated rejection. Am J Transplant. 2016;16(10):2816-2835. Miyashita T, Nakanuma S, Ahmed AK, et al. Ischemia reperfusion-facilitated sinusoidal endothelial cell injury in liver transplantation and the resulting impact of extravasated platelet aggregation. Eur Surg. 2016;48:92-98. Peralta C, Jimenez-Castro MB, Gracia-Sancho J. Hepatic ischemia and reperfusion injury: effects on the liver sinusoidal milieu. J Hepatol. 2013;59(5):1094-1106. Richardson PG, Soiffer RJ, Antin JH, et al. Defibrotide for the treatment of severe hepatic veno-occlusive disease and multiorgan failure after stem cell transplantation: a multicenter, randomized, dose-finding trial. Biol Blood Marrow Transplant. 2010;16(7):1005-1017. Strouse C, Richardson P, Prentice G, et al. Defibrotide for treatment of severe veno-occlusive disease in pediatrics and adults: an exploratory analysis using data from the Center for International Blood and Marrow Transplant Research. Biol Blood Marrow Transplant. 2016;22(7):1306-1312. Boyer TD, Haskal ZJ, American Association for the Study of Liver Disease. The role of transjugular intrahepatic portosystemic shunt in the management of portal hypertension. Hepatology. 2005;41(2):386-400.